Obverse: Sixth laurel head bust of George III, Text around GEORGIVS III DEI GRATIA (George III by the Grace of God). Reverse: Crowned shield within garter with HONI SOIT QUI MAL Y PENSE (evil to him who evil thinks) on the Garter, and BRITANNIARUM REX FIDEI DEFENSOR (King of the British, Defender of the Faith) around the edge, and that date 1813 split between the edge inscription and the garter. History: During the Peninsular War against Napoleon, in 1813, it was necessary to strike 80,000 guineas to pay the Duke of Wellington's army in the Pyrenees, as the local people would accept only gold in payment. This issue has become known as the Military Guinea. 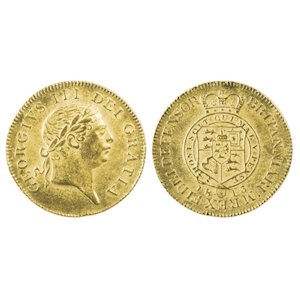 At this time, gold was still scarce and the guinea was trading on the open market for 27 shillings in paper money, so the coining of this issue for the army's special needs was a poor deal for the government. This was the last issue of guineas to be minted before the change to a sovereign coin.